Encyclopedia of Native American Tribes, Third Edition is a fully updated reference discussing more than 200 American Indian tribes of North America, as well as prehistoric peoples and civilizations. Arranged alphabetically by tribe or group, this comprehensive work offers 60 new entries on tribes not covered in depth in the previous editions. The informative, accessible text summarizes the historical record—locations, migrations, contacts with non-Indians, wars, and more—and includes present-day tribal affairs and issues. The book also covers traditional Indian lifeways, including diet, housing, transportation, tools, clothing, art, and rituals, as well as language families. 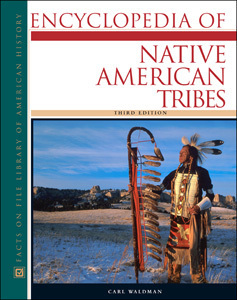 Encyclopedia of Native American Tribes, Third Edition includes at least one representative tribe from each language family or language isolate for each of the culture areas. Many new entries include tribes in California, Alaska, and Canada. "...enjoyable and informative for all ages and should be in every school and public library. Students searching for information to write a report will love this reference." "...recommended for high-school, public library, and undergraduate collections...Its added coverage will make it especially useful in libraries in California and the Pacific Northwest." "This well-written and easily accessible encyclopedia is a good starting point for research on Native American tribes...definitely a worthwhile purchase for anyone who doesn’t own the previous volume." "...a critically important, superbly presented, essential and core addition to professional, academic, and community library Native American Studies reference collections."